Artist Elizabeth Stingl’s Transportation, Movement, Destination exhibition at the Goat Coffee House this month takes an artsy angle on transportation. If you are like me, when you think of mass transit and art the first things that pop in your head are a song by Kris Kross (which always necessitates a YouTube pit stop) and the cool new murals on the sides of Eau Claire Transit buses. Now, a new art exhibit called Transportation, Movement, Destination is going to push how you think about these two things further, and possibly help all of us rethink how we use our extensive mass transit system in the Chippewa Valley. After she returned, Stingl says she missed the way mass transit was so integral to her life in Ireland, where she was able to travel between cities without having to own a car. Multi-municipality mass transit always seems to have vocal public support, though that support never travels down to the wallet when it comes time to actually build it. The show will run all of July at The Goat Coffee House, 408 Water St., and on July 20 Eau Claire Transit will bring one of its buses to the lot next door, creating a pop-up park. 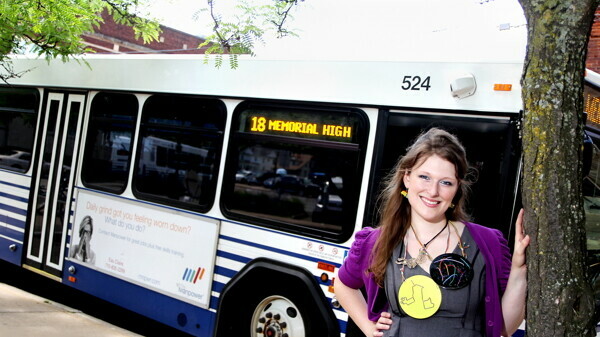 (The inside panels of the bus will feature works from another exhibit, Art on the Bus: Green Transportation Edition.) To raise funds for the show, Stingl is using the Eau Claire Regional Arts Center’s power2give.org website, which she hopes will make this community-driven project a success. Stingl says that proceeds from the show will go to Chippewa Valley Transit Alliance, a nonprofit group that advocates for alternative modes of transportation. Artist Elizabeth Stingl’s exhibit Transportation, Movement, Destination will be on display at The Goat Coffee House, 408 Water St., during normal business hours throughout July. A reception on 2:30-6:30pm Saturday, July 20, also will include a city bus in the lot next door.